In complex times, it is good to go back to simple basics. There is a need to review fundamental principles, methods of action and tactics. It is good to gather together scattered friends from across the country to take stock and make future plans. The Columbus Day weekend event at the TFP national headquarters also served as a time to compare notes since most of the participants had helped organize the 2093 protests against the blasphemous film The Da Vinci Code. The last national conference had been the setting for the plans that led to these theater protests. The American TFP was honored with several noteworthy guests. Delivering the Sunday luncheon address was Prince Bertrand of Orleans-Braganza who traveled from his native Brazil to be with those present. Also speaking was Captain Guy Gruters, retired Air Force pilot and former prisoner of war during the Vietnam conflict. Indeed, for the purposes of analyzing events, there is nothing more basic for the TFP than the book, Revolution and Counter-revolution by TFP founder Prof. Plinio Corrêa de Oliveira. TFP choir members sing during the evening rosary procession. 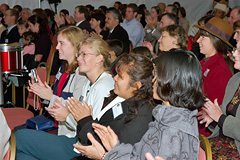 The characteristics of the Revolution and the Counterrevolution and its concrete application to our days served as the main focus of the 2006 National Conference talks. Thus, the conference began by presenting the basic elements of Christian ideals in society. Mr. Norman Fulkerson presented a description of Christian civilization as presented in the medieval order. His masterful presentation analyzed many of the misconceptions and deliberate historical distortions that often prevent Catholics from understanding and admiring this epoch. TFP Washington Bureau Director Mario Navarro da Costa discussed “A Revolution-Counter-Revolution View of History.” The talk contested the popular view that history is a random sequence of events and argued the need to understand and apply a theology of history based on the perspectives of Saint Augustine. Using examples found in daily life, TFP Vice President John Horvat affirmed that the fundamental concepts of Revolution and Counter-Revolution are so basic that everyone has a vague notion of them. He asserted that the best way to engage defending the Faith outside the Church doors was for participants to assert their Catholic identity in the public square and thus confound those seeking to destroy Christian civilization. No Counter-Revolutionary action can be conceived without a firm foundation in the laws governing society. TFP Senior Researcher Luis Solimeo gave a refreshing summary of eternal law, natural law and positive law in which he disputed the subjective concept of such law that is often used by the Revolution to push its agenda. How theory applies to daily life was the theme of TFP veteran Nelson Fragelli, President of the Luci Sull’Est campaign in Italy. Mr. Fragelli developed what is generally referred to as the Cultural Revolution and its importance in changing mentalities. Finally, American TFP member Michael Drake made the connection between the Fatima Message and the Counter-revolution His dynamic presentation sought to explain why the Fatima message is so important and an integral part of the Counterrevolutionary message. 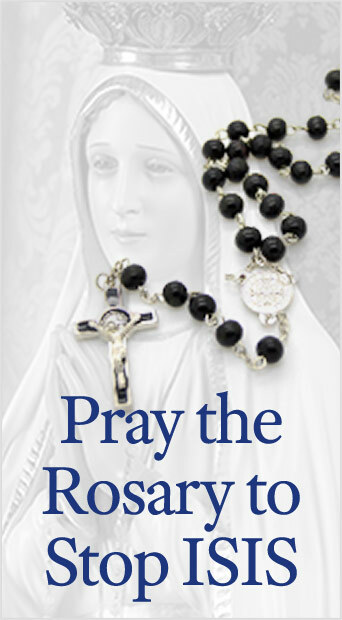 Because Fatima involves basic concepts such as the revival of the notion of sin, the distinction of good and evil and the unmasking of final goals, it is a major challenge to the Modern World. However, the conference was about more than talks about basics. There were other talks to broaden the horizons of participants. Capt. Guy Gruters gripping description of how his Catholic Faith sustained him in a Vietnamese prison camp was especially memorable. Mr. Alejandro Ezcuura of the American TFP Peruvian sister organization Tradición y Acción spoke of his long friendship with Prof. Plinio Corrêa de Oliveira. The Sunday luncheon keynote speech about the need to be involved in the Counterrevolutionary defense of the Church by Prince Bertrand of Orleans-Braganza was especially appreciated by the participants. Mr. Luiz Antonio Fragelli’s “The Meaning of Life” final address was a fitting conclusion to the whole round of talks. And through the days, there were opportunities to get to know each other. Ample coffee breaks between talks were occasions to meet new people and converse with old friends. Behind the scenes, students from the TFP-run St. Louis de Montfort Academy and members of TFP Student Action were everywhere helping to make sure things ran smoothly. The conference had its cultural aspects. The atmosphere was especially prepared to reflect the principles being defended. Even the large tent which served as an auditorium was decorated with taste and care to provide a proper ambiance for the talks. 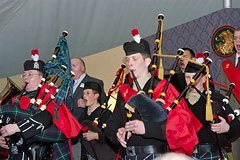 The TFP’s Holy Choirs of Angels Band was another cultural highlight with an evening performance that featured a delightful and lively selection of pieces for drums, fifes, brass and bagpipes. The cultural also met the spiritual and supernatural. 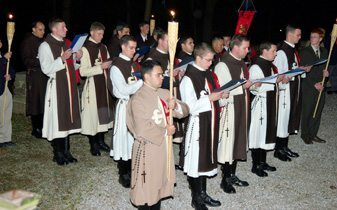 Especially memorable was the evening candlelight Rosary procession. Despite the threat of rain, the American TFP’s life-size replica of Seville’s Our Lady of Hope, Macarena was carried on a large litter and majestically presided over the touching event. The faith of the participants triumphed as the shower held off until after the procession was over. And then there was the closing High Mass celebrated at the historic Immaculate Conception Church in York, Penn. early Sunday afternoon. Held with the permission from Most Rev. Kevin Rhoades, Bishop of Harrisburg, the Latin Mass was sung by the TFP members, wearing the ever-present TFP ceremonial habit, and attended by nearly 300 participants and local Catholics. 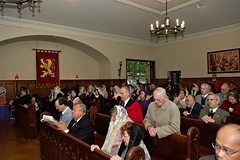 The recessional procession ended with the majestic rendition of the Papal Hymn accompanied with organ, trumpet, drum and choir. 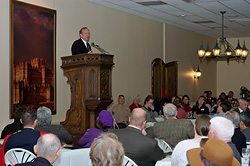 After Mass, the closing dinner as held at the grand ballroom of the nearby historic Yorktowne Hotel with closing remarks by TFP Chicago Bureau chief, C. Preston Noell III, who spoke of the lessons learned from The Da Vinci Code protests. The participants had seen the basics and, now, were ready for further action. As the final farewells faded into the night, they came to realize how basic and reassuring it is to come together for events of Catholic fellowship and camaraderie. All prepared for the long return home where new battles certainly await.